Holidays are back! Swim in a lake with sweet, colourful teddybears! Tap on teddybears swimming in the water to rescue them because it is not really safe to be a teddybear and try to swim. It sounds funny, but the game is also funny, and that is the point! SINGLE PLAYER - the camera fly over the lake. You gain your points by tapping teddybears (or pandas, or kittens). You unlock hidden items while playing. And there is a recorded replay to watch after the play. You can also compare your score to your friends scores in a facebook's ranking. HOT SEAT - play with your friends on one device, up to 4 players. One has to tap as many teddybears as he can in a limited time. Then next one takes his turn. You are playing until somebody will get 1000 points. Then he has got one star. The winner is the one with 3 stars. - 2 animals (teddybears, pandas), <-- and soon comes more! 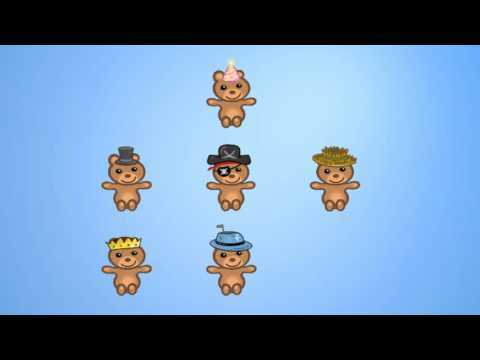 - cute sounds of teddybears enjoying the holiday season, <--- very cute! - you can compare with friends via facebook's ranking. - 2 game modes: single player, hot seat (max 4 players). 'Personal Information' is information or an opinion that identifies you as an individual. We do not collect any personal information from you whatsoever from within our app. If you contact us directly for any reason, we may keep a copy of that correspondence and your email. Your email is collected only to keep you informed of new products and changes to our existing products - we will never pass your email onto third parties. Swimming Teddybears connects to social networks so you can share content from the app and your progress in the app and see the progress of your friends. To facilitate this we temporarily use your first name, profile picture and friends list from Facebook, and we use your first name and profile picture when you share content from the app with your Friends. Only your friends will see this and we do not save this data. You can use your Facebook settings for this app to control what you share and with who. We do not attempt to collect any sensitive information. We will not sell, trade, rent or disclose any of the information you provide to us for any reason, without your prior consent. Otherwise, your Personal Information will only be disclosed where required or allowable by law.